Notice the thick, heavy rim at the top of the shoulder blade. It can take your weight. Lately I’ve come to have a whole new appreciation for my shoulder blades, and in particular, for the thick part at the very top rim. In the past, I always imagined my shoulder blades to be light and fragile, part of a gossamer shoulder girdle meant to float on top of my ribcage. Now I feel the tops of my shoulder blades as bones with substance, strong supports for my upper back. As long as I stay connected to them, they can help me erase the effects of sitting at a desk, and of every other front-chest collapsing activity, from cooking to driving. Even more magically, my new shoulder blade understanding has deepened my twists, enlivened my shoulder stand, and given me a new lift of my front chest in seated pranayama. I have Mary Lou Weprin to thank for this. 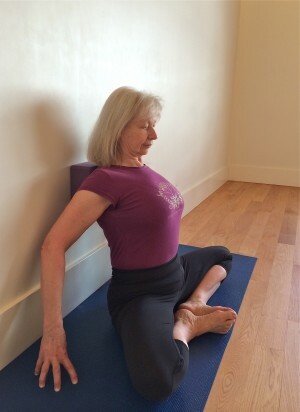 Mary Lou normally teaches in Berkeley, at The Yoga Room. But early in March, she travelled north to Nanaimo, B.C., for a weekend workshop. On Friday evening, she taught a version of Baddha Konasana (bound angle pose) that involves leaning into a dense foam brick at the wall. She told us that she teaches this pose in every class, and true to her word, we worked on it every day for the three days of the workshop. The demonstration looked disarmingly simple and relaxing. We were, after all, sitting down. But you’ll soon what makes this a worthy Five-Minute Yoga Challenge: it takes work to press the top shoulder blades into the brick and broaden them away from your spine, while simultaneously growing wider across your collar bones. Touch your fingers to your shoulder and lift your elbow to the ceiling to make your shoulder blade move down. Try it once, and you’ll feel a new openness in your upper body. Make it a daily part of your practice, and you may be surprised by where it leads you. Press your hands into the floor to help lift your chest. Place a dense foam brick at the wall, and lean back, so the top edges of your shoulder blades come to rest on the brick. 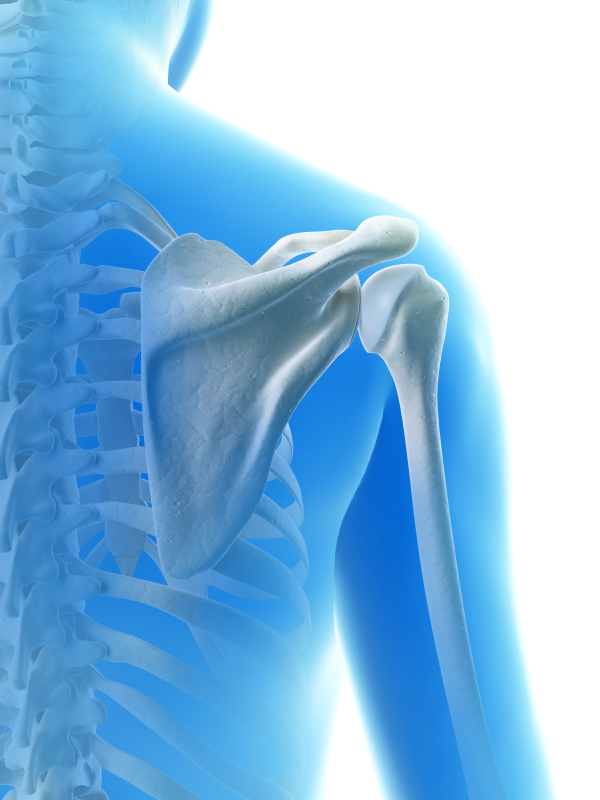 Make sure that your shoulder blades are moving away from your ears. One way to do this is to set your shoulders as you would in Savasana: bring one hand at a time to its own shoulder, with your elbow no wider than your shoulder. Then reach your elbow up to the ceiling. You should feel your shoulder blade move down and come into a cleaner contact with the brick. If you have trouble feeling the work when you try this pose, your shoulder blades are probably rounded forward, away from the brick. Once your shoulder blades are set, lean back into the brick. It helps to press your hands into the floor to start, both to lift your side ribcage and to press back into the brick. Broaden the tops of your shoulder blades out to the tips of your shoulders. Then take your awareness to your front body and broaden your collarbones out to the tips of your shoulders. You should feel your front chest lifting. Check that your top buttock rolls to your mid buttock, so your lower back stays long. Let your chin move to your chest to release any tension in your neck. You may notice that your neck feels some strain in this pose, especially after a few moments of serious effort. Try dropping your chin toward your chest. You might be surprised how close you come to the chin lock (Jalandhara Bandha) you need for seated pranayama. You can work your legs in the pose – your inner thighs stretch toward your inner knees and your outer knees pull back toward your outer hips – but don’t lose the focus on your broadening, lifting chest. Stay in the pose until you have a firm imprint of the brick in your upper back. Five minutes would be a good goal. Then use your hands to bring your knees back together, and come out of the pose. You can take this imprint with you into many other poses. All you have to do is inhabit the tops of your shoulder blades, and suddenly, as though you had a new invisible friend, there’s extra freedom in your twists, and more sensitivity and broadness in your shoulder stand – in fact in all poses in which the shoulders connect with the floor. So lean into your shoulder blades. They can take it. To my Nanaimo friends who were at Mary Lou’s workshop: I’d love to know what part of the work you’ve found most useful. Please comment. Thanks so much for extending the teaching Mary Lou gave us! We’ve used the grip of a wooden brick at the inner elbows – while reclining the scapulae over a bolster- elbows bent as they grip and extending over head. This is an action that we use in back bends and sirsasana too. Much work on shoulder girdle! Also standing and facing the wall- side and front body extensions while foam blocks under palms slide up the wall. Wide back deltoids,firm in on outer arms,to create more lift,shoulders, torso and hips draw away from wall. Space in lumbar region so kidneys don’t press in. Concepts like: equal and opposite stretch, rhythm and median line permeated the workshop. Plus working with lifting “up and over” joints. Yes, the shoulder girdle did get a workout, didn’t it? I had forgotten that piece – facing the wall and sliding bricks up – thanks for reminding me. Ever since the workshop I have been so conscious of lifting “up and over” the joints. What a difference in standing poses! Thank you for bringing Mary Lou north, and for all of the work you did in hosting and organizing. Much appreciated. I loved the lean into the brick in Baddha Konasana too Eve. After the weekend I felt so much more in touch with all dimensions of my body. In general for me it was the many “pearls” of alignment that were strung into a necklace over the course of the weekend. There were many pearls (the box of the trunk, diamond of the abdominals…), but three things that I did put asterisks beside were: lining the feet with the 2nd metatarsal, balancing the inner trochanters in U. Trikonasana and “pushing the floor away”. and bonus! So great to finally meet you in person! Tracey, great to meet you too. I too fell in love with my inner trochanters and I’m still exploring all the ways that being aware of them opens my poses. I’ll be unpacking this workshop for a long time to come. Thank you so much for sharing your five minutes of yoga wisdom. I’ve been teaching for 14 years, but you know, there is always more to learn. Thank you! Thanks Gaileee. I know I’ll always be yoga student no matter how long I teach. We just learn what we can, and pass it along.